Gilford’s museum buildings abound with evidence that wood has been a truly important part of our cultural heritage. Not only was wood used to construct buildings and to burn in fireplaces and stoves for both heat and cooking purposes, but also wood was used to make furniture and tools and, yes, even toys. It is no wonder then that over the years more than just a few volunteers at Gilford’s Thompson-Ames Historical Society have focused their attention on advancing the timeless appeal of wood. Vintage items – some used by members of the Potter family on Potter Hill Farm – are displayed in ready reach of visitors to invite their gently touching the wood smoothed by years of use right here in Gilford. To cite just a few examples, in the Historic Store there are wooden planes and axe handles; in the Homestead Room, a wooden cradle and butter molds; in the School Days area, wooden desks from the one-room school houses; in the Rowe House, furniture and, yes, wooden toys. Playing with wooden toys is part of the activities planned for youngsters during their annual third-grade field trips. Volunteers have been working together to create these wooden toys of historic design. There is an opportunity for more volunteers to get involved. The goal is two-fold: to create more toys for use during field trips and to give the public (preferably children working with adults) opportunities to create some wooden toys based on historic design. 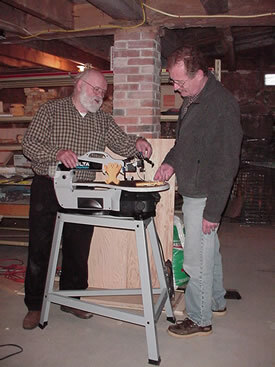 Recently Stan Piper purchased a Delta Scroll Saw to help facilitate these wood-working endeavors. If there is sufficient interest, opportunities to work with wood can be offered monthly by Thompson-Ames Historical Society, similar to its Heritage Arts and Crafts Bees. This provides another opportunity for volunteer involvement If this interests you, please telephone T-AHS at 527-9009, and leave a message as well as your name and telephone number and you will receive a return call. The informal “Welcome Get-Together for Volunteers”, planned for Saturday morning, April 9th upstairs in the Grange Museum Building, 8 Belknap Mountain Road, in Gilford Village, is another opportunity to learn about Gilford’s Historical Society and express your interests. This also is a chance to meet with T-AHS Board members as well as community members in general who are interested in Thompson-Ames Historical Society. Persons who wish to help with Spring Cleaning – indoors and/or out – may sign up to do whatever they wish to do and help out whenever their calendars permit. The more the merrier! Many hands make light work! any day now – so do get a copy for yourself so that you can mark your calendar for events that you wish to attend..
Also, do check T-AHS’s website www.gilfordhistoricalsociety.org for the latest news and calendar listings.